One of my goals for the new year is to post updates on the our little family more regularly…hopefully weekly, but we’ll see. Hope no one is holding their breath on that one. 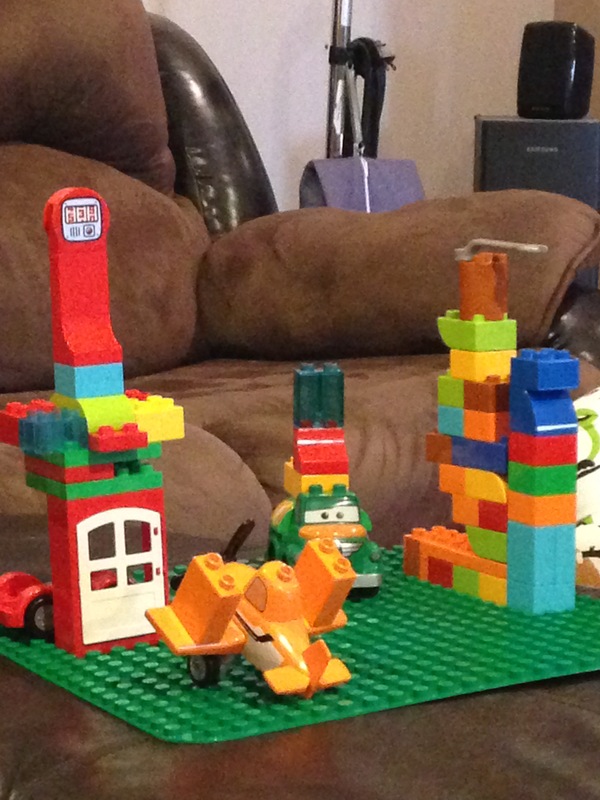 One of Grant’s creations….he has really enjoyed his new Duplo Legos! This week was pretty uneventful. Husby worked Monday-Wednesday and was given Thursday and Friday off for the holiday. While he was at work early in the week, the kids and I enjoyed some time relaxing together. We watched several episodes of their new favorite show, “Once Upon A Time”. They played with their new toys and basically just had fun. Tomorrow we start back to schooling, so I wanted to give them a chance to truly “veg out”. 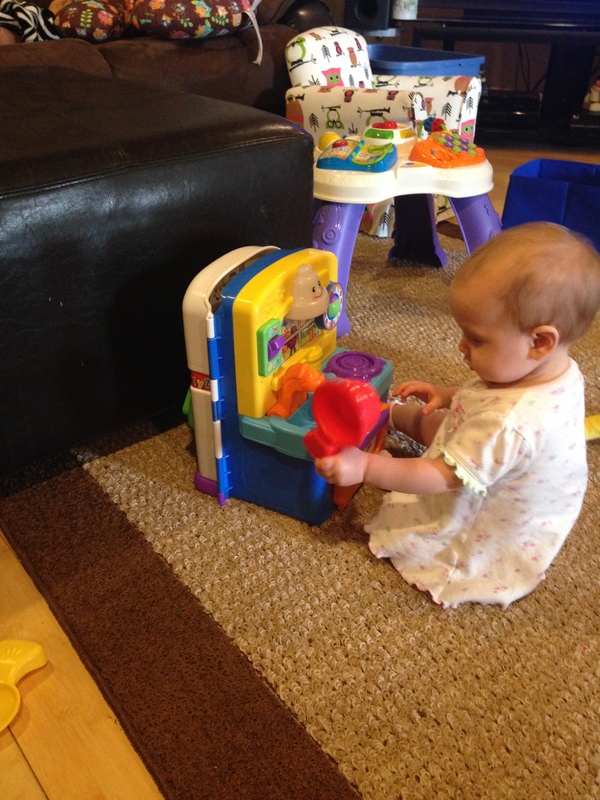 Chyler playing with her new kitchen…..she loves this thing! We also took down all of the Christmas décor around the house this past week. And the past couple of days I have spent some time cleaning and getting our house back to normal. I love the whole Christmas season and everything that comes along with it. I love the decorations, and the movies, and the music, and all of the traditions. But every year around December 20th, I find myself feeling anxious for the big day to be in the past. Not because I don’t enjoy Christmas, because I do! But because I begin to feel overwhelmed by all of the stuff that invades my home in December. I genuinely start to look forward to the week after Christmas just as much as Christmas itself, because I can’t wait to have my home back to normal. So, it was nice to get that taken care of. Chyler is now 8 months old and is all over the place. She’s constantly crawling behind us, everywhere we go. And she’s using furniture, toys, and sometimes her brother to help her walk around as well. I have no doubt that she’ll be taking those first unassisted steps very soon. She’s also experimenting with standing on her own and we’ve been surprised with how long she stays balanced. Also, an important part of this development is that she doesn’t just topple over when she’s standing, but rather, slowly lowers herself to the floor. It’s hard to believe she’s growing up so fast….but I know from experience that it doesn’t slow down. So, we are making sure to treasure this stage while it’s here. The three older littles are doing well. We’ve all been fighting off a cold for the past month. It seems as soon as I can get one kiddo healthy, another one starts asking me for a box of Kleenex to keep a runny nose at bay. But I guess that just comes with the time of the year. It’s been rainy and cold here lately but it’s about to get a lot colder in the coming week. I see a lot of hot chocolate being served in our house this week. I’ve also decided to start sharing videos of our family as a way to capture memories that might otherwise be forgotten. If you’re interested in following along, check out our Youtube channel! I’m off to make myself some breakfast! Until next time….